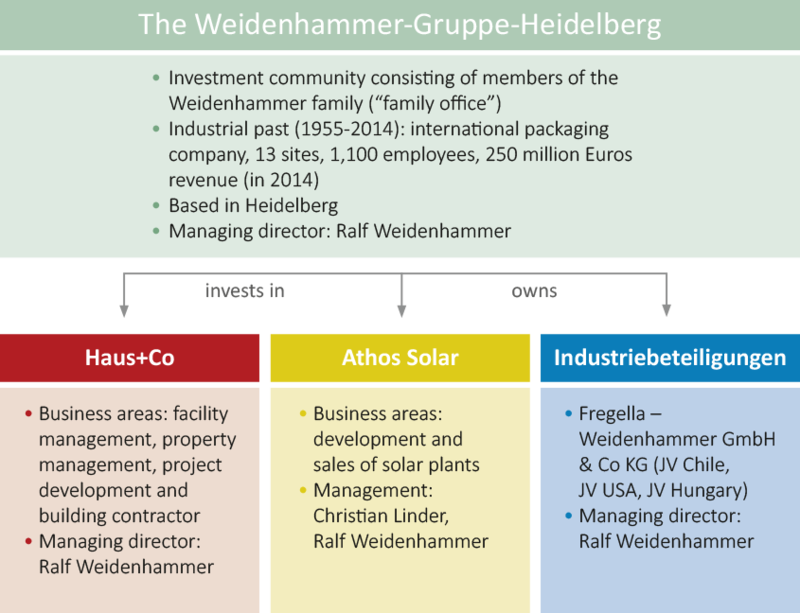 The Weidenhammer-Gruppe-Heidelberg (WGH) is an investment community focusing on projects in real estate and photovoltaics. Investments in real estate or large real estate projects. The latter are developed, realized and managed by our subsidiary Haus+Co Projektmanagement GmbH based in Heidelberg. Investments in renewable energy, especially highly efficient photovoltaic plants producing solar energy. These plants are developed and realized by our second subsidiary, Athos Solar GmbH, which is also based in Heidelberg. A considerable part of our affiliates’ projects remains in possession of the WGH. In addition, our “family office” owns several properties from its industrial past.